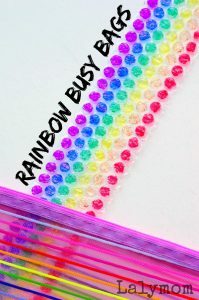 Welcome back for another Busy Bag Blog Hop! 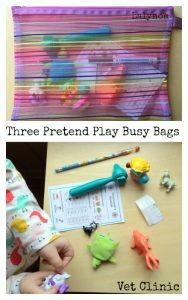 This month the group is focusing on spring activities for kids! We've got some super fun tutorials for you, including affiliate links to help with supplies! With a four year old and a two year old in the house, I am always trying to think of activities that I can use with both of them. Sometimes I succeed and sometimes not so much. These are all ones both kids can do. 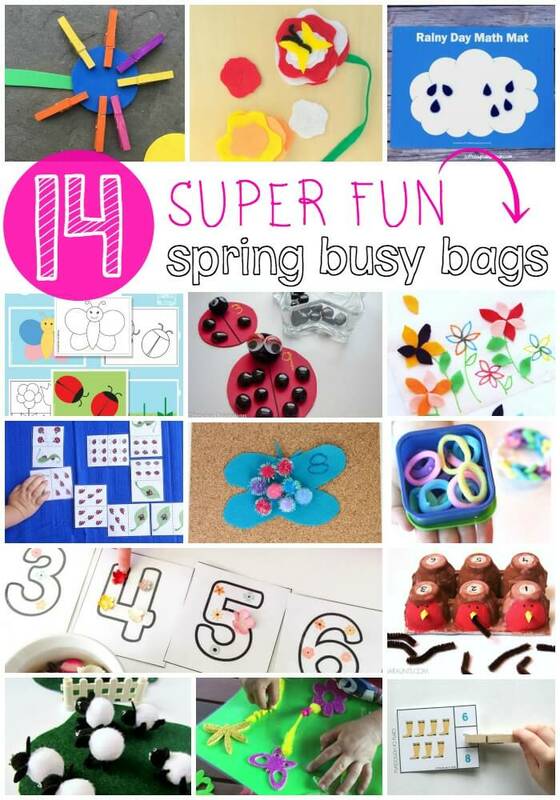 Of these three spring activities, my four year old liked the Dew Drop Flowers and the Button Snake the best and my two year old liked the Flower Shape puzzles the best. We recently had some warmer weather after a harsh winter in Chicago so we started talking about Spring. When my four year old and I talked about it we tried to think of all the things that mean Spring to us. We thought of rain showers, rain boots, flowers, seeds, gardens, butterflies, grass and umbrellas. I asked her what her favorite sign of Spring was and she said flowers so we chose that as our theme for these busy bags. Cut the strip of green felts or ribbon for the stem of the flower. Cut one butterfly shape from another color of felt. Wrap the black pipe cleaner loosely around the butterfly body and tuck the end of the green ribbon/felt around the belly side of the pipe cleaner to secure it. Glue the green piece if desired or else wrap tightly around the pipe cleaner. Now twist the pipe cleaner where the butterfly head would be and trim the pipe cleaner with the wire cutters. Curl the ends of the pipe cleaner to make them look like antennae. Next glue or hot glue the craft button to the opposite end of the green piece. Cut out various sizes of flower shapes from different colored felt and snip a slit in the center of each one. 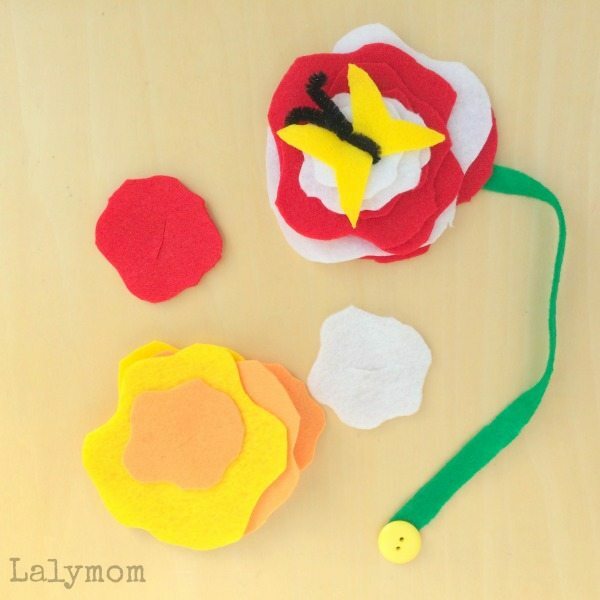 Show your child how to button a flower shape onto the flower stem and slide it to the butterfly. Depending on your child's age and abilities, you could practice size comparison by starting with the smallest flowers and working up to the largest, or rainbow color order, patterns or different shapes as desired. Use your scissors to cut various puzzle type lines down the center of each flower. 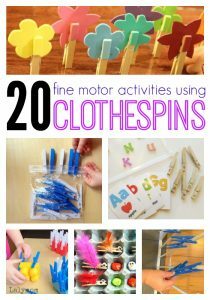 You can decide based on your child's age and abilities how complex to make this activity. For younger children, use only one of each color flower and make the puzzle lines very simple. 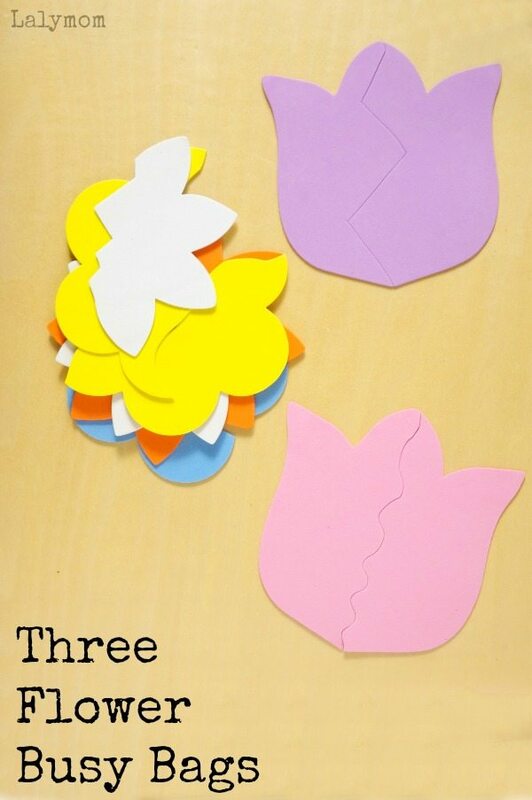 For older kids you could use multiple flowers of the same color and/or cut each flower into more pieces. Show your child how one flower goes together or allow him to just jump in play with the pieces to start matching them up. This activity is inspired by all of our Tinker Bell activities lately. There is one Tinker Bell tries to make dew drops with the water fairy. I saw these bath appliques in our Family Dollar and thought it would be fun for my daughter to place dew drops on and off the flowers. Set out the appliques, put the marbles into the container. 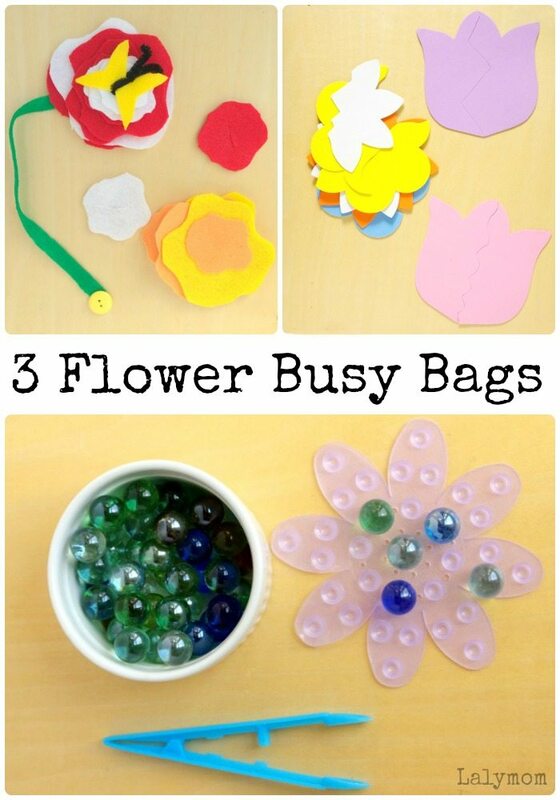 You can also choose to start by putting the marbles onto the flowers and having your child transfer them into the container. There are more ways than I realized to play with this set! You can just put the marbles on and off the flowers. 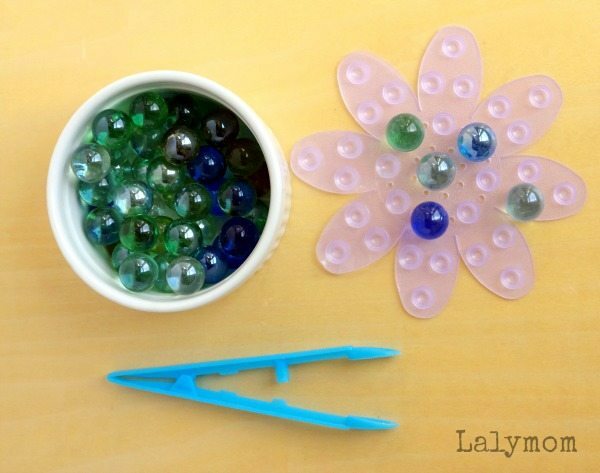 You can also show your child that if you press the marbles into the suction cups that they stick. However a little water will make them stick even better and you will have less of a chance of them falling off. You can count the marbles as you put them back into the dish. You can make patterns on the flowers. You can also play a game with more than one player to see who can collect the dew drops the fastest. If you liked this post please pin it and be sure to check out the other Spring themed activities below! Previous Post: « “You’d Never Know She Is Sick.” But What if You Could Save Her? I love how you always seem to come up with so many ways to play with the same (adorable) set!! You knocked it out of the park once again!! Such creative, motivating ways to get little hands ready for writing.